Anyone here remember Ham Salad Sandwiches? Maybe it was a midwest thing, but man I used to like that stuff. In fact, I’ve missed it so much that last night I decided to try and make some Vegan Ham Salad, and let me tell you….this Indiana boy is one happy camper. For those of you who have no idea what I’m talking about …. Years ago, I used to work in a small Mom & Pop Grocery Store. We had 4 aisles, including a small produce section and a meat department. Now we sold conventional prepackaged deli meats like everyone else, but we also had a deli slicer where we would slice up the big loaves of bologna, ham, etc as well. I’d plop down a pound of sliced ham or olive loaf on some of that white butcher paper, weight it, and tape it up with a price tag for the cashier….remember those days? Well, when we got down to the ends of those loaves….we would toss them into a big plastic bin and save them. And when that bin got full, we would grind up all those various pieces into a hamburger like consistency. Then the deli girls would mix in a gallon jug of mayonnaise, pickle relish, and paprika (by hand), and we called it Ham Salad. They didn’t use gloves back then either….can you imagine? Ahhh ….life in the 80’s. 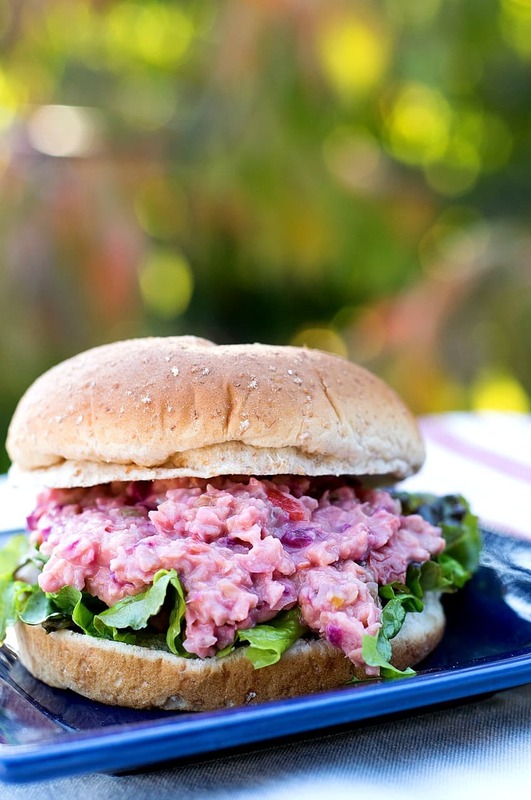 So it was kind of like Tuna Salad….only instead of Tuna we used ground up lunch meats,,,,,,, and it was GOOD! Really! I’d take my break and pile this stuff on my sandwich bread at least an inch thick……mmmm. My poor arteries…… if only I had known right? Well as bad as it sounds….I’ve really missed this stuff. Convenient sandwich material…..right? Something to munch on during the game or whatever. So last night I played around with some chickpeas, ham flavorings, and beets of all things….and came up with this recipe. And let me tell you, it satisfies my Ham Salad craving perfectly. First, we’re going to need some mayonnaise, about ¾ of a cup. Sure, you can use Vegannaise or whatever….but that’s loaded with oil and fat….so why not take a few extra minutes and make your own? 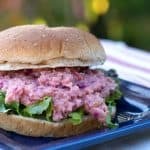 I’ve used this mayonnaise recipe in my Vegan Turkey Salad and my Vegan Potato Salad, and it’s not only easy, its low-fat as well. Drain and rinse a can of White Beans (cannelloni beans will work too) and add them to your blender. Add in the remaining mayonnaise ingredients and blend until smooth. Scrape down the sides occasionally if necessary. This will make about 1 cup so you’ll have a little extra left over. 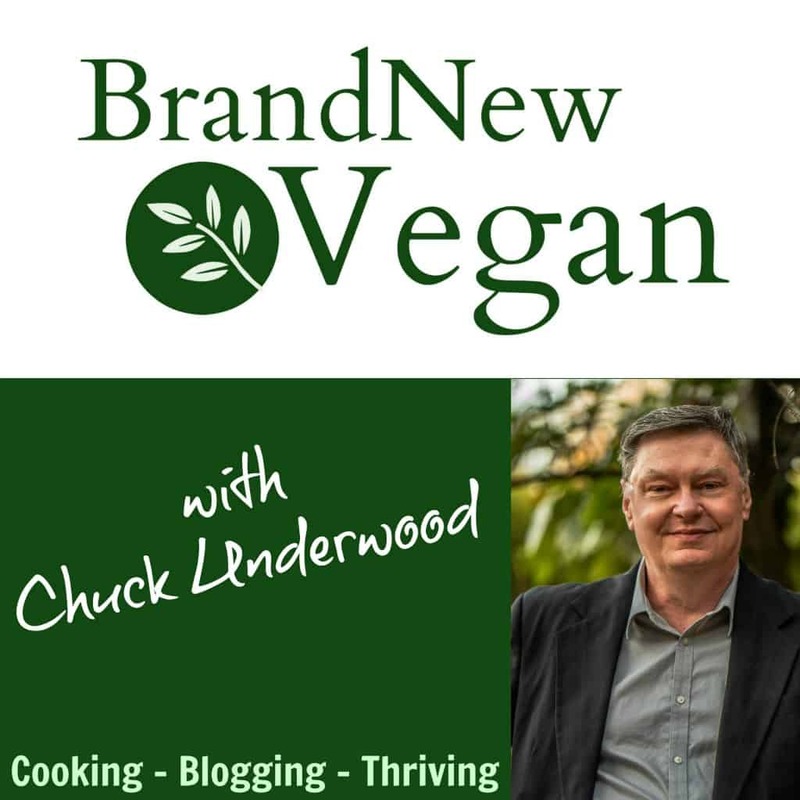 Drain and rinse a can of Chickpeas (Garbonzo beans) and add them to your food processor. Also add 1 rib of Celery, roughly chopped so it will fit, ½ of a Red Bell Pepper, about ¼ of chopped, raw beet that you’ve peeled and diced, 1/3 cup of pineapple chunks (frozen is easy), and 2 Tbs of dried, dehydrated Onion Flakes. Give your food processor a whirl or 2 to start breaking everything down. We’re not making hummus here – so don’t go crazy. Add in your ¾ cup of Mayo, ¼ cup Sweet Pickle Relish, ¼ cup Dijon Mustard, 1 tsp Soy Sauce, ½ tsp Garlic Powder, and ¼ tsp Liquid Smoke. Gently pulse the mixture a few times until it JUST starts to come together. Again, go easy or you’ll end up with a pink paste…..probably not very appetizing either. Scrape your salad into a bowl and refrigerate it for a while to allow all those flavors to meld together, and…..
And we have Vegan Ham Salad. Goes great on a sandwich, but you could also serve it up with oil-free crackers, or as a topper for your green salad. However you enjoy it , I hope you DO….enjoy it. I know it brings back many happy memories for me. 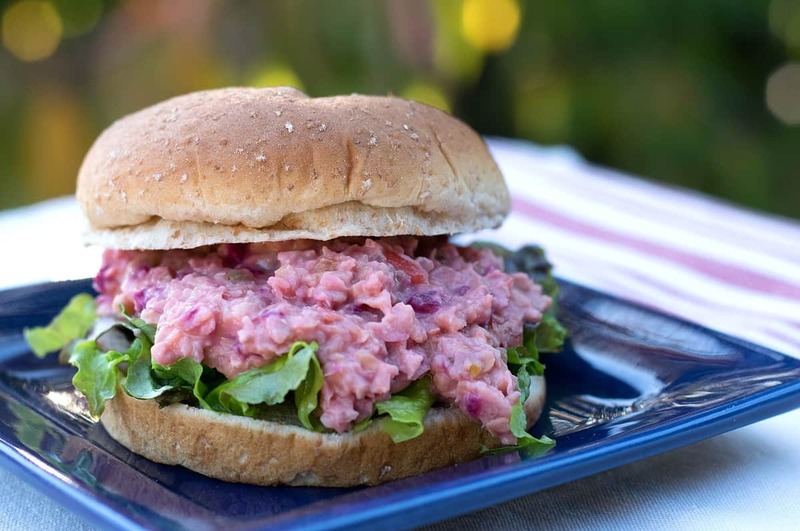 This Vegan Ham Salad is a tasty blend of chickpeas, red bell pepper, pineapple, and beet to replicate my favorite midwestern sandwich spread. Drain and rinse the can of White Beans and add to blender. Add remaining mayo ingredients and process until smooth. Scrape down the sides if necessary. Drain and rinse a can of Chickpeas and add to a food processor. Add bell pepper, celery, pineapple, dried onions, and beet and pulse a few times - just until everything starts to break down. Add in mayo, relish, mustard, soy sauce, seasoning, and liquid smoke and pulse just until mixed. Scrape out into bowl, cover, and refrigerate for at least 1 hour. Garnish with Smoked Paprika if desired. I’m allergic to chickpeas (I know, right?). Do you think a white bean would work in the ham salad recipe? I usually use navy beans or canalleni beans as a sub. Which do you think would be better? I’d go with the larger bean then….so the cannellini.. I think it is hilarious that your last name is Underwood and you are showing a faux potted meat product. 😀 It looks great and I will make it this week. Thanks so much for the pureed white beans suggestion instead of vegan mayo. I don’t know why I never thought of that, but I am glad you did! Does this really taste like ham? It looks so realistic… I’m getting a few ingredients I need for this and trying it out. Cheers !! Clever! I am going to try this – I do remember those sandwiches! I will definitely try your mayo recipe. Your ham salad was absolutely genius and delicious! Thank you for your dedication to finding “good ole comfort food” replacements! Ham salad used to be one of my absolute favorites! Thanks for you love and commitment to food! You’ve got to be kidding! Awesome! I’d make it right now, but don’t have any beets, and I’m snowed in. But I’ll get some asap. Maybe I’ll buy some canned beets and freeze in portions for this recipe, so I can make it whenever (unless you think canned won’t work well). I can’t think of a substitute for today – can you? I can almost taste this – thanks so much! YES!!! I used to LOVE ham salad. A true Midwestern girl from Wisconsin!! Thanks for coming up with this recipe and sharing it with all of us!! I look forward to making this. I can’t stand beets. Doesn’t that make it taste earthy? Anything else I can sub? I used to always eat ham salad in the summer on top of pretzel chips! It’s funny that it’s only a midwestern thing; I never realized! I was so happy to find this recipe since I had a craving today and it tastes so similar; even my meat eating family loved it. A staple in the Midwest! Along with chicken salad and beef salad. Any chance of a recipe to complete the trifecta? Beef salad was my favorite! Roast beef chopped with the same ingredients as ham or chicken salad! Gotta try this! Thanks Chuck!